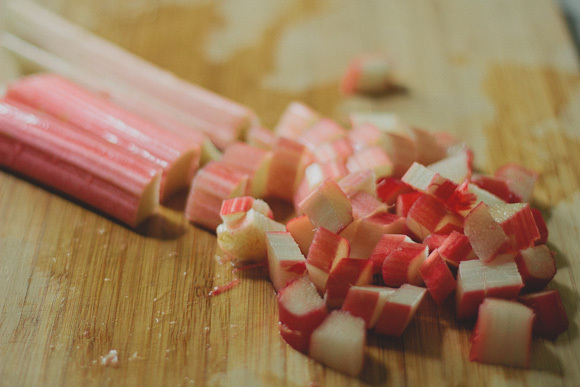 This is by far my favorite spring rhubarb recipe. Its a perfect blend of tart rhubarb, sweet brown sugar, and a hint of cinnamon. I found it a few years ago in my Van Zante family cookbook. The Van Zantes are on the maternal side of my family tree, and a few years ago my cousin gathered together recipes from my grandmother's kitchen as well as my aunt's and lots of cousins. She bound them together in a cookbook, and it is such a special heirloom, a living heirloom really because many of these recipes wind up on my kitchen table again and again. 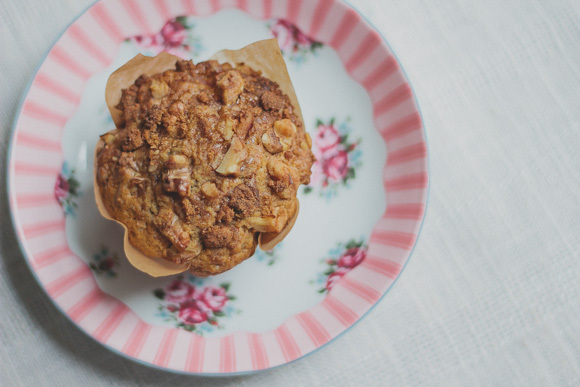 This recipe for Rhubarb Walnut Muffins comes from my cousin Jenny Van Zante (she's the one who worked so hard to put the whole cookbook together!). 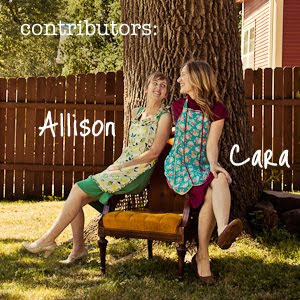 She has an adorable blog about raising her 4 children on the farm in Iowa. 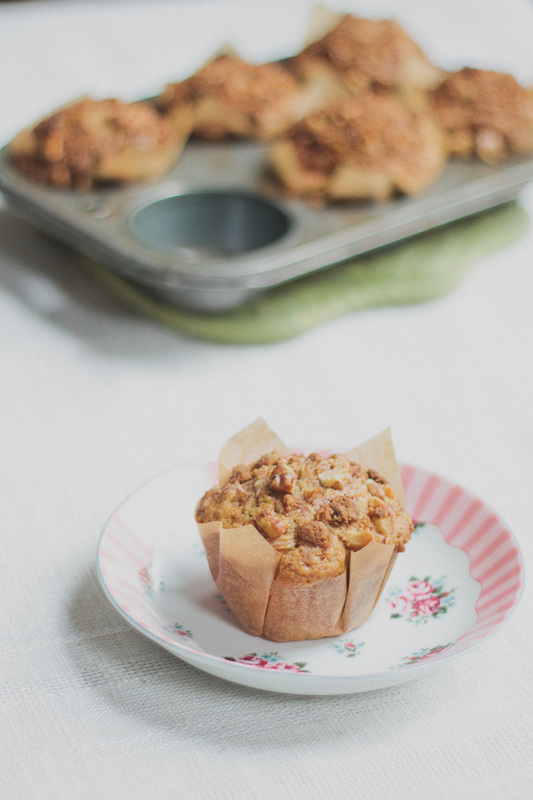 I've made a few minor changes to this recipe over the years; I've swapped some of the white flour for whole wheat flour, added a little extra rhubarb, and I like to fill my muffin tins all the way to the top for a big, rounded muffin. When I see rhubarb appear in the store in May (someday I swear I'll have my own rhubarb patch) I buy it up because it doesn't stay on the shelves long in the city. I make a batch or two of these muffins, maybe make some compote, and dice and freeze the rest for making pies or jam late spring/early summer. In a large bowl, combine flour, brown sugar, baking soda and salt. In a separate bowl, whisk together oil, egg, buttermilk and vanilla. Stir wet ingredients into the dry ingredients just until moistened (do not overmix). 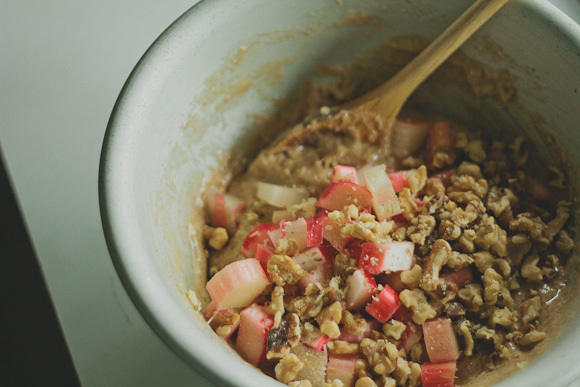 Fold in rhubarb and chopped walnuts. 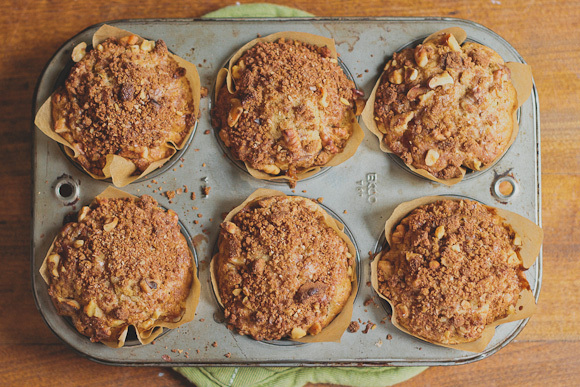 Line your muffin tin with paper cases or parchment paper cut into squares and tucked into the cups. Fill paper-lined muffin cups full to the top. Combine topping ingredients and sprinkle over the muffins. Bake at 375F for 20-25 minutes or until a toothpick inserted in the center of the muffins comes out clean. Cool 10 minutes in the tin before moving to a wire rack. *Buttermilk in a pinch tip from Martha Stewart: Add 1 tbsp of lemon juice or white vinegar to one cup of milk, stir and let sit for 5 minutes to make you're own buttermilk. 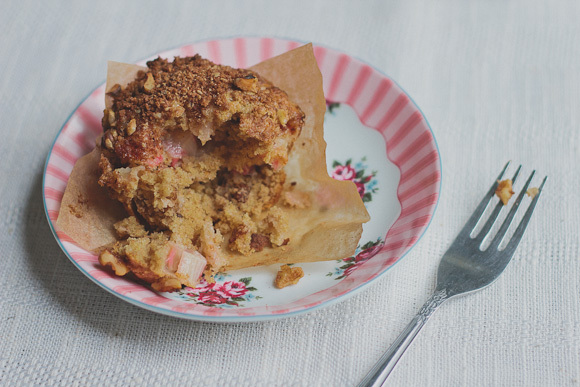 I'm on the lookout for a rhubarb cake recipe, if you know a good one please send it my way! Cara, these look fantastic. I've never cooked with rhubarb. I'll have to keep my eyes open for some. Recipes collected by loved ones are a special addition to anyone's collection. I have a book of my grandma's favorite recipes (in her handwriting) and one from you girls too. They are such a treasure. Glad you got your hands on some rhubarb! Your almond addition sounds delish. I"ll have to try it -- next spring! Rhubarb season is over here, for now. Thanks for sharing!